Monday-Saturday: 10:00 am - 9:30 pm; Sunday 12 noon - 8:00 pm. Aventura Mall is defined by Culture, Style and Taste. The shopping center recently debuted its new three-level expansion wing, highlighted by experiential additions to the Arts Aventura Mall program, including Aventura Slide Tower, a nearly 93-foot-tall spiral structure by artist Carsten Höller, which acts as a towering landmark and an exhilarating slide. The wing also includes the much-anticipated return of Zara, the first Topshop Topman in Florida, Treats Food Hall, and an array of dining destinations. In addition, Aventura Mall features a collection of upscale boutiques, including Gucci, Louis Vuitton, Givenchy, Cartier, Tiffany & Co., Fendi, Burberry and more, as well as more than 300 shopper favorites such as Apple, Ted Baker, Anthropologie and Urban Outfitters. Aventura Mall is open Monday through Saturday, 10:00 a.m. to 9:30 p.m., and Sunday, 12:00 p.m. to 8:00 p.m. 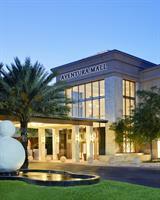 Call (305) 935-1110 or visit online at www.aventuramall.com.